Ever wondered what goes on behind the scenes at a festival? Offering a unique perspective as both seasoned professionals and fresh newbies, the collective behind mammoth, THIS THAT and UP DOWN have put together their top five tips for kicking off a new event, and what you need to consider along the way. If you are using a public outdoor space for your event, like UP DOWN, the first thing you need to do is meet with the local authorities. This includes the local government, transport services, security services, regulators like liquor licencing, emergency services and neighbouring businesses and property owners. If you’re organised with the right documentation and getting your event off the ground will be much easier. Everyone needs to know your plan so make sure you’ve got a neatly prepared proposal ready. This will include things like an event brief, emergency procedures and maps. A HUGE part of festival planning is budgeting. Knowing how much everything is going to cost can be hard if it’s your first event. If you have previous experience at budgeting for events, great! If not, try to enlist some buddies who have the knowledge. Find out what your ‘break-even’ point is and try to stick to your budget as much as possible. A good budget and growth strategy means you can put on an event that lasts year on year, and avoid being a one trick pony. Don’t spend all your money on bands and skimp on the essentials. 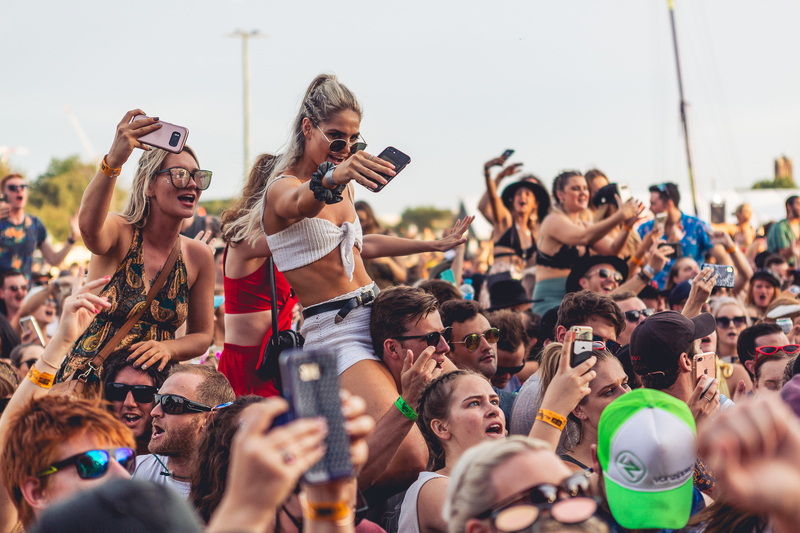 This includes paying attention to things like portaloo, food vendor and bar ratios to keep queuing under control and ensure everyone has a good time when they arrive. It’s also important to plan and budget for disasters – a healthy contingency will help with this and give you peace of mind if things go wrong. What kind of environment do you want to create? What kind of punter do you want to attract and what else is already in the market in the same geographical area and at the same time of year? For UP DOWN, we are holding the event right beside the beach at Camp Shortland so we want to create a relaxed summer party vibe. The ocean breeze will definitely help and people are encouraged to wear their best summer threads. First impressions are EVERYTHING! If your event doesn’t look the part, it won’t hit your target market and it won’t sell tickets. Investing in good graphic design, marketing and publicity is really important. In the lead up to the event, you need to have a plan to reach potential ticket holders. A strong, coordinated launch announcement is incredibly important. Plus a professional photography and videography team on the ground to capture the action will make your job so much easier when it comes time to promote round two. #HOTCONTENT will be in constant supply. For UP DOWN we’ve got a mix of international and local DJs and live acts that we are super excited to see. Booking within your budget and making sure the vibe is right can sometimes be the hardest part of the event. Our advice is to start well in advance. Some larger acts (especially international ones) need to be booked in over a year in advance. Generally though, once you get your headliner/s sorted, the rest is relatively easy. Always make sure you’ve got a solid booking agreement in place with your artists. You want to make sure you’re covered if something goes wrong. Knowing the value of the artists you’re booking is one of the key factors to a successful event. It’s extremely important to consider the following when looking at artists for your line up. Have they played in the area recently? And if so, will your ticket buyers want to see them again so soon? What ticket price are they charging for headline shows they’ve been doing lately? Are they selling tickets at their own shows? And if so, how successfully are they selling? What activity do they have planned from when you announce to when the festival is going to be happening? Do they have any new releases coming out or any other tours announcing? 5. Build your team and make the magic happen. Our UP DOWN team are a brilliant bunch of people. We’ve had some of the same team members for over 10 years running festivals and events and we are a big family. Volunteers are a great and essential part of any event but you really need to have a loyal core team in place to carry knowledge from event to event. It makes such a huge difference to the running of the day when there’s a well-equipped team who can work together. Some of the hours during event time can be extremely long and tiring but when you’re surrounded with good people with a common goal (to make sure everyone has a good time!) the festival goers can really feel it and they notice. That’s when the magic happens.